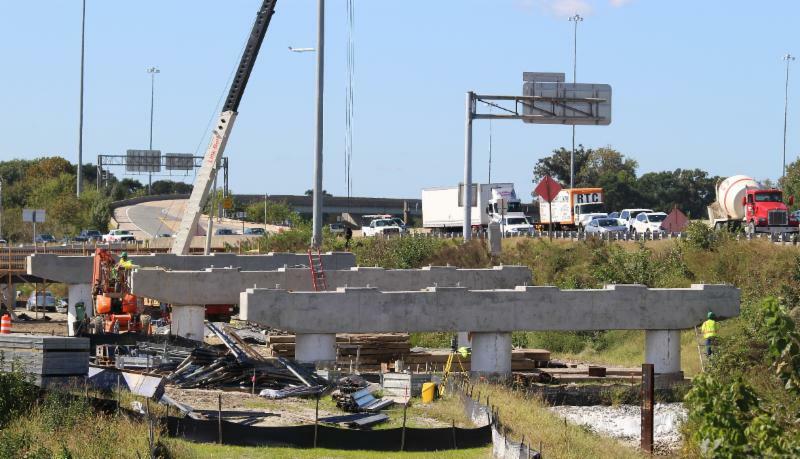 The bridge piers that will support the new collector-distributor lanes running along I-264 east are completed between Kempsville and Newtown roads, clearing the way for another phase of construction next month. These piers, shown in the above and below photos and their location indicated in red in the upper right diagram, will have steel girders installed across them in November. 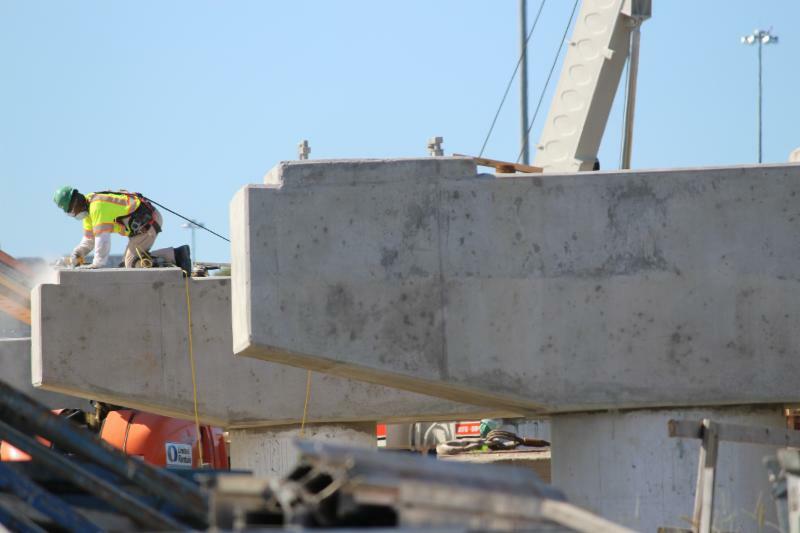 The girders will run parallel to the interstate and will eventually support the road deck for the new collector-distributor lanes serving Newtown Road and later Witchduck Road. 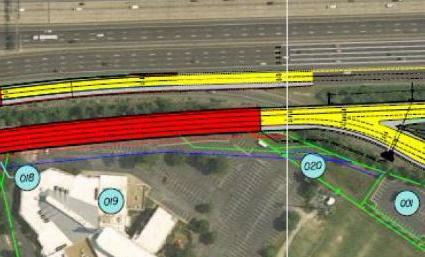 Click here to view a full map of the Phase I improvements. 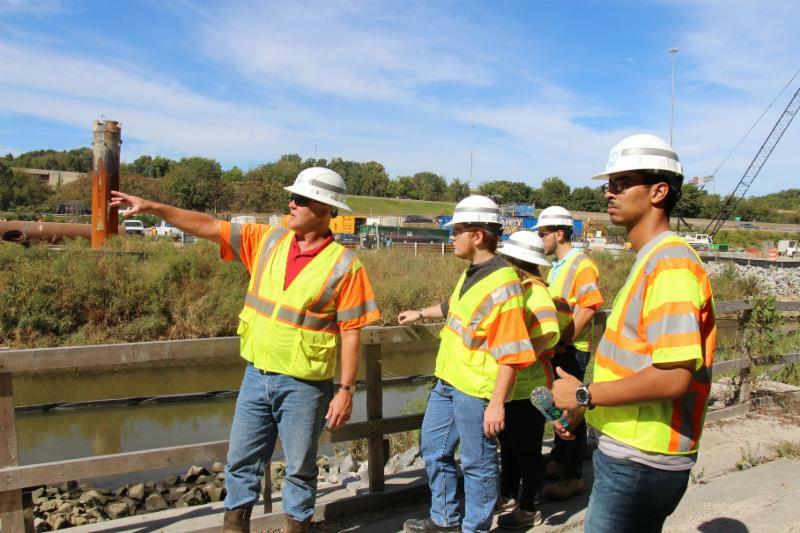 A group of civil and environmental engineering students from Old Dominion University saw their classroom lessons in action while touring the I-64/264 Interchange project in October. The seven seniors, all members of ODU's American Society of Civil Engineers chapter, watched subjects ranging from foundation work to water management put to practice on a scale the size of which they hadn't seen before, said Andrew Bunn, the chapter treasurer and a VDOT intern. "Everyone really enjoyed the experience," Bunn said. VDOT Area Construction Engineer James Klotz (above, left) led one of the tours, which started with a briefing in the project office and led to a walk through the mile-long construction site. Bunn said the tour gave the students a perspective on engineering they can't get in class. For example, he said, he knew how to calculate the amount of rebar for a cage, but figuring it out on paper is "completely different" than what it looks like in person. Installing outfall for South Newtown Road retention pond across Pleasant Point Drive. Construction bids are due in November. The contract award is scheduled for Dec. 6, followed by Notice to Proceed on Jan. 19, 2018. 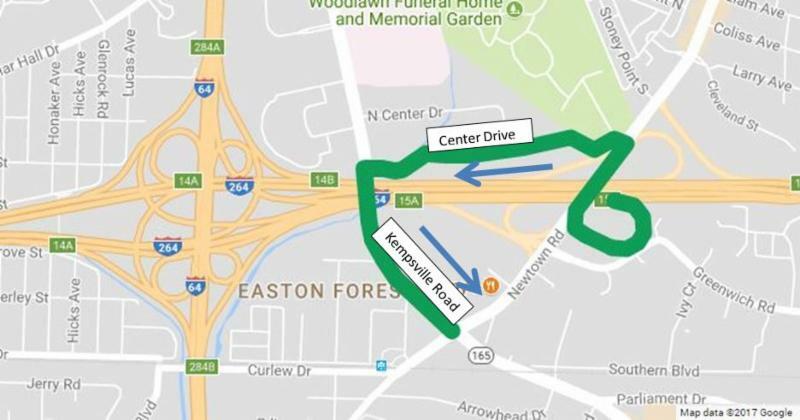 Exit 15A from I-264 east to southbound Newtown Road will be closed beginning 9 p.m. Friday, Nov. 3, until 5 a.m. Monday, Nov. 6. This closure was rescheduled from the weekend of Oct. 27-30. Motorists should also be aware that shoulders along I-64 west and a portion of I-264 east are closed for construction.